A cream and blue beauty! When folks try to tell me that there there is no such thing as a “beautiful tarantula”, I have a few go-to species that I will immediately Google. Besides the P. metallica and C. cyaneopubescens, I also pull up photos of the tarantula featured in this blog, the M. balfouri. 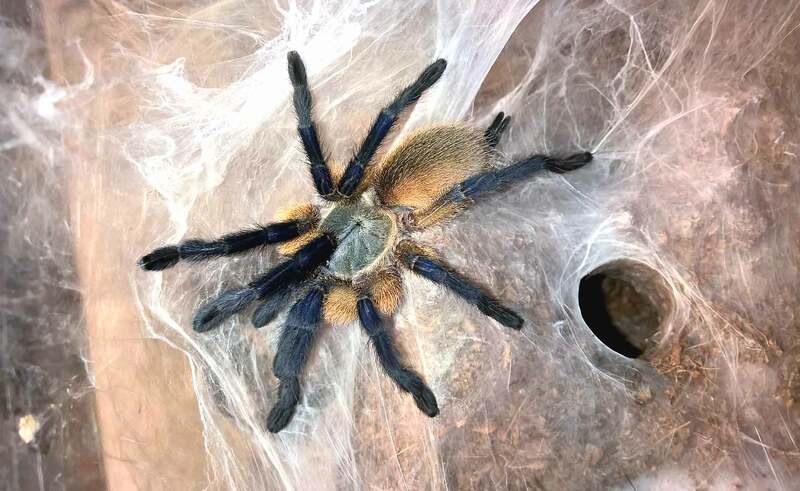 These gorgeous spiders sport creamy tan bodies, metallic blue/silver carapaces, and blue legs, and are a stunning representation of just how striking blue coloration on a T can be. My female M. balfouri, now a young adult. This gorgeous spider comes from a group of islands off the coast of Africa of which Socotra is the largest, hence its common name of Socotra Island Blue Baboon. Although they’ve become much more established in the hobby, they are still in demand, commanding premium prices. I got my juveniles for $60 each as part of a newsletter promotion. Expect to pay up to $100 for the same size elsewhere. I’ve seen females of this species selling for $300, so this can be a pricey pet. This 2″ juvenile is starting to show some of its blue coloration. I’m hoping to see more blue on the legs after its next molt. I housed my three 1,75″ juveniles in medium (5″ x 6″h x 8″l) critter keepers with about four inches of bone dry cocofiber substrate. I provided all three with small water bowls, which they usually fill up with dirt or web over. This species will burrow, creating a maze of underground tunnels with several entrances. They are also prolific webbers, and all three of mine have laid down a thick, silky carpet over much the substrate. As this species comes from a semi-desert environment, I do not mist the enclosure or moisten the substrate; the water bowl is sufficient. Now that my female is about 3.75″ DLS, she will be getting a rehousing very soon. The next transfer will likely be the final one, and she will be getting a 3-4 gallon Sterilite enclosure with about 6″ of substrate (60/40 mix of dry top soil and peat). A top down view of an M. balfouri’s enclosure. Notice the thick webbing. 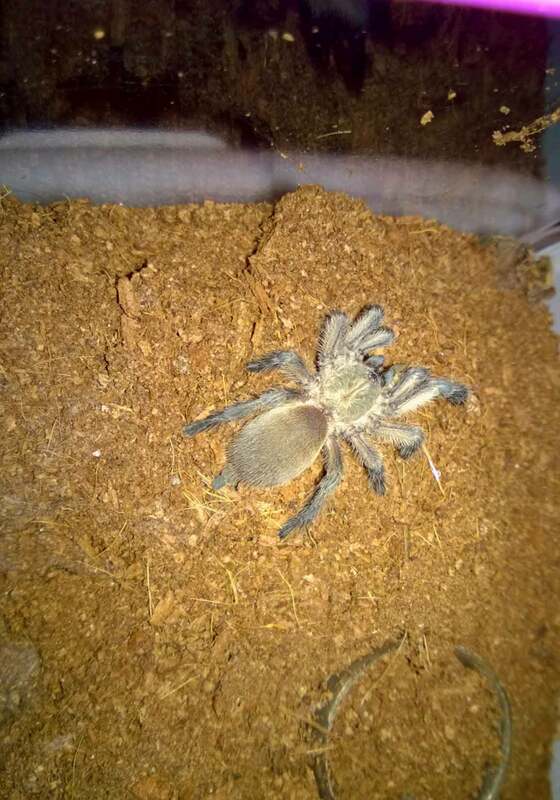 The growth rate for my M. balfouris has been medium, with all three molting five times in my care over a 19-month period. Between molts, they picked up around .25 – .5″ of size or so. 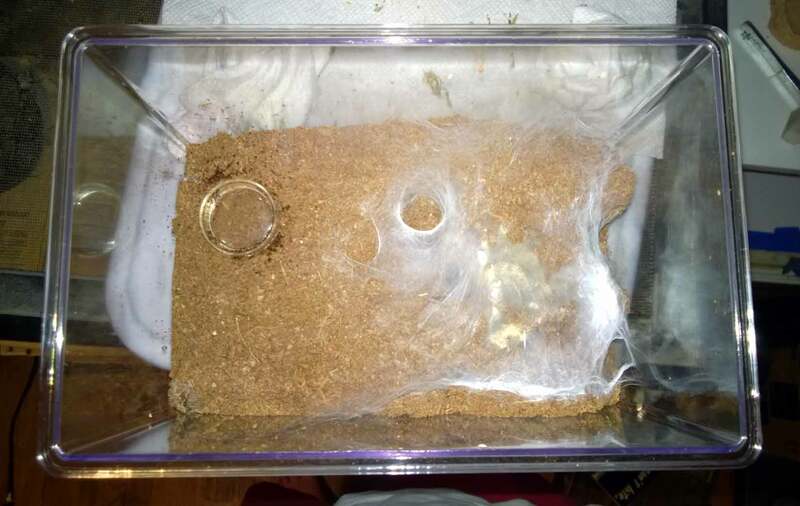 During their first two winters, when temps in my tarantula room were mid 70s during the day and dropped to low 70s at night, they mostly stayed in their tunnels as they fasted for a few months. During these periods, I rarely saw any of them, and I would drop a small cricket in once every two weeks and remove it if it wasn’t eaten by the next morning. When the temps warm up (low 80s during the day, high 70s at night), and their metabolisms are more active and they eat great. I have noticed that they seem to prefer smaller prey, and I was feeding two small crickets or meal worms twice a week when they were juveniles. Now that they are sub-adults, they get two medium crickets a week. They refuse food when they are in premolt or during the slightly colder and drier winter months. During this time, they retreat to their tunnels and surface when the molt process has been completed or when the weather has warmed up. Too much reading? Check out my husbandry video below! This species is generally recognized for having a calmer, less defensive temperament, which could make it a good starter Old World species. Although they are more shy and reclusive than many their baboon cousins, they can still, in theory, deliver quite a bite. Mine generally bolt into one of their many tunnel entrances at the slightest disturbance, and not one has shown any defensiveness. However, that can always change with age, and temperament differs from specimen to specimen. Always use care when working with old world species. Although I’ve read of instances where this species can become a “pet hole”, spending the majority of its time in its den, mine are are actually visible quite often. Usually late afternoon, I can look forward to my three juveniles creeping out of their dens to sit on the surface for a while. They only seem to stay submerged when in promolt or during the colder winter months. This juvenile is showing some of the gorgeous blue on its legs after a recent molt. Although I’ve yet to try to breed any of my tarantulas, the M. balfouri is high on my list when I do. Unlike most other Ts, M. balfouri mothers will actually nurture their spiderlings, killing prey and dragging it into the den to feed them. A search of balfouri breeding and parenting will bring up some fascinating stories about M. balfouri mothering, and most breeders have more success when they leave the sacs in with the mother. It doesn’t get much cooler than that. 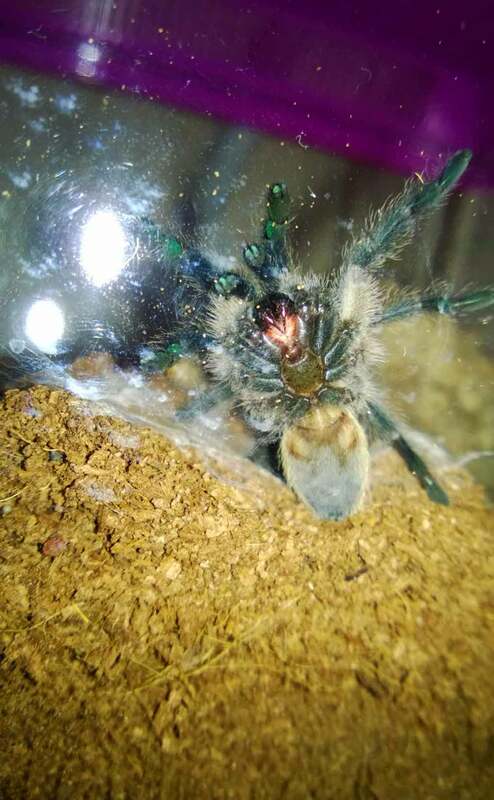 Those looking for a gorgeous old world tarantula with beautiful coloration and relatively simple husbandry requirements should look no further than the M. balfouri. Their calmer temperaments also make them a good, if pricey, introduction species for those new to old worlds. Excellent article Tom!, besides their slow growth rate, and their lack of aggression towards prey items, this is quickly becoming one of my favorite Terrestrial species. Hey, Jesse! Thanks for reminding me about this husbandry article. Now that I’ve seen them in action in the communal setting, I’m going to have to revise it to include some of the communal observations. I completely forgot about this! I agree completely…this is one cool little spider! hi tom, this M. balfuri is wonderful! ive had mine for a little over a year now and im staring to look for a male around the same size, she is now at a leg span of three and a quarter inches im hoping to breed her after her next molt 3-4 months. you are the fist person ive sought out to ask if you are interested in talking more with me id love to hear from you. thank you. Hello, Vladimir! Thanks so much. Have you seen the videos with my M. balfouri communal? That’s fantastic that you’re thinking of breeding. Are you in the US? Hi, Hannah! Please, feel free to send it to tomsbigspiders@outlook.com . I’d love to take a look!